The Army has some physical solutions coming soon down the pipeline, like its Indirect Fire Protection Capability Increment 2 system the service has prioritized to detect and counter UAS and cruise missiles. Several other solutions and upgrades to current systems have been tested in a variety of exercises from Black Dart to the Network Integration Evaluation to the service's recently concluded Army Warfighting Assessment. But the unclassified version of the strategy the Army's Training and Doctrine Command released Tuesday doesn't just list equipment it wants to develop, but attempts to outline how it will "provide forces at all echelons with solutions across the doctrine, organization, training, material, leadership, personnel, facility-policy (DOTMLPF-P) framework that will enable defeat of UAS threats." The plan "seeks combined arms solutions, utilizing capabilities from every warfighting function, in a coordinated, synchronized way. It seeks cross-domain solutions, recognizing that the C-UAS mission set exists in every domain, not just in the air," the strategy states. "It seeks a whole-of-government approach, recognizing that a comprehensive C-UAS capability will involve [joint, inter-organizational, and multinational (JIM)] partners from all areas of government, working together towards a common goal." Ideally, the threat can be addressed "left-of-launch" -- or before a UAS even takes off -- by using an approach that brings in a variety of key warfighting functions. While it's obvious that air defense would play a central role, the Army's strategy involves addressing capability among fires forces that can detect, track, identify and engage threat targets as well. Then there's protection and intelligence units that can bring capability to cover, conceal and deceive enemy forces, the strategy notes. "The goal of this solution seeks an end state where a rapid and seamless integration of capabilities aggressively address the entire spectrum of the UAS threat, from the national strategic level down to the individual soldier," the strategy states, using both passive (automatic) and active measures. And looking beyond what the US military can do, the Army notes that multinational partners have "aggressive" C-UAS plans of their own and the US and foreign partners should combine efforts where possible and "avoid redundancies and conflicts." According to the strategy, the Army will focus its efforts in four different areas: Mission command, detection, identification and defeat. The mission command effort will focus on airspace control and management to nail down the right procedures for countering-UAS in the airspace. Rules of engagement will need to be "properly tailored" to ensure threats are defeated quickly while lowering the possibility of fratricide. A common tactical air picture and an early warning system is also needed. In the near-term -- or by 2020 -- the Army’s plan is for commanders to use existing Army and joint data networks to bring information to the lowest Army units. In the long-term -- in the next five to 25 years -- the Army will develop a "comprehensive, tailorable Common Operating Picture (COP) distributed automatically to all soldiers who require it," the strategy states. The Army notes that it will still likely have to rely on a visual or auditory confirmation of the presence of a UAS. 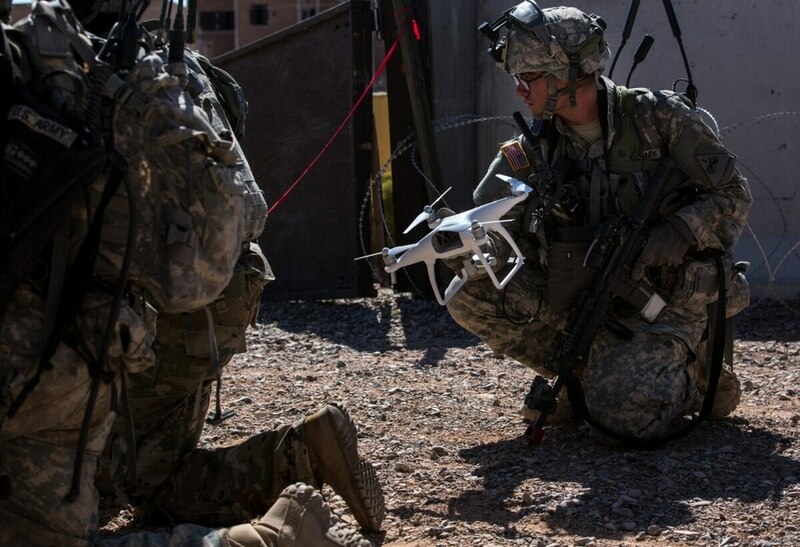 "Individual soldiers must be trained to recognize the sound of a UAS, trained on visual scanning techniques and be prepared to communicate critical target information (distance, direction, and type) to higher echelons," the strategy says. Procedural methods will be put in place to identify a UAS including its behavior flying in an established airspace, the point of origin and other characteristics, according to the strategy. Having airspace control is a "major enabler." And also key to identification is a visual confirmation, the strategy states. "While the number of UAS types is enormous and varied," the strategy acknowledges, "they take on only a few primary physical forms." Therefore, training soldiers to identify UAS based on primary characteristics will help determine the nature of the UAS. The capabilities to defeat UAS, the strategy notes, is not exhaustive, but is "intended as a broad framework" giving commanders multiple options to defeat enemy UAS. Countering an enemy’s ability to conduct reconnaissance easily using drones is another way to defeat UAS. "UAS plays a significant role in reconnaissance for both threat and friendly forces," the strategy states. It specifically cites how Russia is using UAS in Ukraine to spot forces and relay targeting information for artillery attacks on the discovered locations. Therefore, counter-reconnaissance plans need to take UAS into account, the strategy says. When an enemy UAS comes into close contact, the strategy calls for individual soldiers and units to be well-trained on how to properly respond. Units and soldiers must conceal, camouflage, harden and deceive against enemy UAS just as they do to prevent artillery or other kinds of attacks. "Relatively simple solutions such as camouflage and smoke can have a significant impact on threat UAS operations with minimal effort required by friendly forces," the strategy states. The use of a unit's resident direct fires system must also be an option when units are threatened by a UAS, according to the plan.